Feeding kids can be a game of hide and seek or hit and miss. Some foods are an instant hit and easy to get kids to eat while others you have to hide or sneak into a sauce. Teaching kids young about nutrition won’t solve the green vegetable debate with your toddler, but it will help them to grow up understanding the importance of eating a variety of foods and being healthy. Teaching kids about nutrition is an important as teaching them to read and write and having them understanding the benefits of eating well early on will encourage a healthy relationship with food. As soon as you start introducing solids, talk to your child during meal times about what food they are eating and why it is good for them. Tell them that carrots are orange and good for their eyes, that avocado is yummy and green, that bananas give them energy and pears have lots of fibre. Show them a fun way to keep track of eating fruits and vegetables by challenging them to eat something from all the colours of a rainbow! When they come with you to the grocery store and reach for the Fruity-O’s cereal explain why you prefer the low sugar, whole grain cereal without the artificial food dyes and offer to buy the Fruity-O’s for making necklaces or to glue onto art projects. It’s important to explain why you are not going to buy ‘real’ fruit squishers and prefer they have a bowl of real strawberries instead. Read labels, introduce them to ingredient lists and show them the unhealthy side to many packaged foods. Set a rule early on that is it always вЂhealthy food first. Instead of saying “NO dessert if you don’t finish dinner,” tell the kids to have a healthy dinner first, then dessert. When you are out, encourage them to fill up on healthy food choices first before hitting the candy machine, dessert table or snack bar. Say yes to requests for treats, but qualify it with the ‘healthy first’ rule. It leaves the kids feeling like they are not being denied a treat and parents are still able to enforce the importance of healthy choices. You don’t have to go into the entire Health Canada food pyramid and serving sizes but a simple fun exercise of cutting out different foods from a grocery store flyer can go a long way to helping kids understand that eating a variety of foods is key. At meal time discuss what is a protein, a grain, dairy, fruit or vegetable and have the kids determine if ityou are eating a balanced meal. mashed potato I serve. 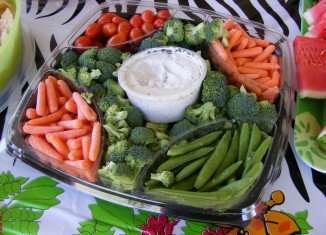 Every meal has fresh vegetables on the side that they do like ” carrots, broccoli, peas, corn, beans ” and every healthy homemade snack, casserole or soup has the rest of the vegetables they are not so keen on. Talk about healthy food and food in general at meal time, at the grocery store and when commercials come on TV. Discuss the benefits of real fruit vs. fruit leathers and drinking milk or water instead of soda. Hand your baby pieces of banana to chew on instead of packaged baby foods and remember, it is never too early to teach your kids about healthy food.